First graders love playing with balls, and bouncy balls can provide hours of fun. 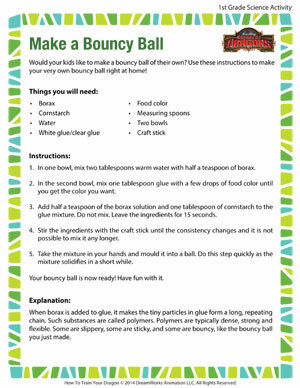 This free science activity gives them a chance to make their very own bouncy ball! With a little food coloring, kids can make their bouncy balls any color they want. While it may seem like pure fun, this science activity is a great way to introduce the concept of polymers to young kids. Just use the information provided to explain the reaction to your kids.